Full Tilt Poker offers a healthy 100% first deposit bonus up to $600 and new depositors will gain automatic entry to 10 $5k freerolls. Beyond that, the sheer range of promos on offer is sure to whet your appetite. The awesome VIP programme notwithstanding, there are freerolls galore, 1up tournaments, “In The Money” SnGs, leaderboards, and even a “Happy Hour” where you can accumulate double or even triple FPPs as you play. 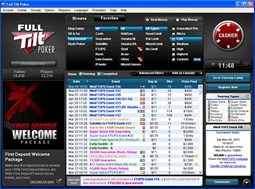 Before Black Friday Full Tilt Poker was the coolest online poker site in the world. It was the poker site built by poker players for poker players, with, many argued, the best software, and certainly the most impressive roster of ambassadors, comprising the best players in the world. In the wake of Black Friday, however, the site was thrown into turmoil, with accusations of foul play and financial mismanagement. Now, having been rescued by former rivals PokerStars, Full Tilt is back, and under new management, retaining its much-loved identity and software, but now with the added financial clout of PokerStars behind it, meaning your money’s now safe. Full Tilt was always the home of high stakes, where you could go to railbird the best players in the world playing the nosebleeds, and those crazy $500/$1,000 are back. And, with the likes of Tom Dwan, Gus Hansen and Viktor Blom comprising the new team it’s still the place to go for the highest action on the net. But beyond that, Full Tilt has always been about providing variety and offers a wide variety of games and stakes. 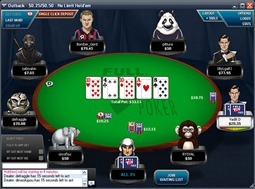 In fact, it has the on of the widest selection of poker variants on the market, with Texas Hold’em, Omaha, Omaha Hi-Lo, Seven-Card Stud, Seven-Card Stud Hi-Lo and Razz all offered, as well as mixed games like HORSE and HOSE in both cash games and tournaments and the original “speed poker” variant “Rush”. The site boasts a huge amount of tournaments, too, with buy-ins from $1 to $25,000, with millions in guaranteed prize pools each week, as well as lots of lively freerolls. Full Tilt’s exclusive software has always been top of the range – it’s fast, customisable and comes with tonnes of features that cater to what players really want, such as the ability to multi-table up to 18 tables at once (OK, maybe we don’t all want that, but it’s comforting to know we could if we wanted to). Following Black Friday, Full Tilt no longer takes American players, and yet it’s still the second biggest site, in terms of player traffic, after PokerStars which allows it to offer a huge variety of games.